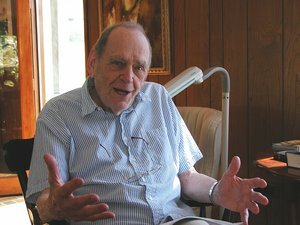 Bullock, N.C. - Dr Eugene Anson Stead, Jr, visionary medical educator whose pioneering studies in the 1940s with cardiac catheterization formed the basis for much of what is now used in the treatment of heart failure, died peacefully Sunday June 12 at his home on Kerr Lake in Bullock, NC. He was in his 97th year. Eugene Stead was born in Atlanta in 1908 as one of six children to Eugene Anson and Emily White Stead. He received his BS and MD degrees from Emory University and completed internship and residency in Internal Medicine and Surgery at the Peter Bent Brigham Hospital in Boston, Cincinnati General Hospital and Boston City Hospital. After serving on the faculty of Harvard University under the tutelage of Soma Weiss, he returned to Emory University as Chairman of the Department of Medicine (1942-46) and Dean of the School of Medicine (1945-46). In 1947 he came to Duke University as Chairman of Medicine. He served in that capacity until 1967, when he stepped down to spend the next 24 years helping younger faculty start innovative programs. Thereafter, faculty and medical students often went to Kerr Lake to visit him and seek his wisdom on matters medical and non-medical. No other single individual had more impact on how medicine was taught and practiced in the mid 20th century America than Dr. Eugene Stead. At Emory and Duke, his research teams described the physiologic basis of shock and congestive heart failure. Later, he was one of the first to see the potential for computers to change the practice of medicine. He coached the team that developed the Duke Cardiovascular Disease Research Databank, a successful experiment using the computer as a time-lapse camera to tie clinical outcome of individual patients to their initial findings and using this process to figure out which treatment might be best for new patients. In addition to his innovations as a researcher, Dr Stead was widely recognized as an outstanding medical educator. He attracted students from many other universities who then went on to leading posts in other schools. Thirty-three Stead trainees became Chairs of departments of medicine. Secondly, he changed the structure of medical education itself by spearheading the 1966 revision of the Duke Medical School curriculum that cut in half the required basic sciences and thereby provided room for a full year of research without extending the overall duration of time spent as a student. This change reflected his belief that most facts need not be memorized because they are quickly forgotten. Instead he argued that students need to learn how to learn what they need when they need it. And finally, he established the Duke Physician Assistant Program and is recognized nationally as the "father" of the PAs. The PA profession itself is a reflection of his belief that it is possible to meet many patient needs without all the time and cost overhead of a traditional medical education. Eugene Stead served as President of the American Society for Clinical Investigation and the Association of American Physicians. He was a founding member of the Institute of Medicine of the National Academies. He was editor-in-chief of Medical Times, Circulation, and the North Carolina Medical Journal. He received many awards including the American College of Physicians Distinguished Teacher Award, The Association of American Medical Colleges' Abraham Flexner Award for Distinguished Service to Medical Education, the Kober Medal from the Association of American Physicians, Durham North Carolina's City of Medicine Award and the William G Anlyan, MD Lifetime Achievement Award from Duke University. Eugene Stead and his late wife Evelyn raised three children. He protected time for the family from his busy professional life. He turned building the house at Kerr Lake into a family project that took twenty-five years of weekends and summer vacations to complete. He is survived by son and daughter-in-law, William Wallace and Janet Stead, daughters and sons-in-laws, Nancy and Alan Atwood, and Lucy and Curt Barnhill; three grandchildren, Elizabeth Stead, Christina Auch and family, and Patrick LaVarre and family. Arrangements by - Cremation Society of Virginia.